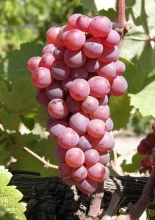 This variety is the pink mutation of Clairette B. 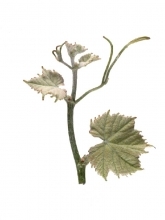 In France, Clairette rose Rs is officially listed in the "Catalogue of vine varieties". The description corresponds to Clairette B, except the skin color of the berries when ripe is pink. Grape maturity: period III, 4to and 1/2 weeks after Chasselas. Aptitudes are close to Clairette B.
Clairette rose Rs susceptibilities and tolerances are identical to Clairette B. The grape clusters are large and the berries are moderate in size. White wine making using this variety produces interesting results in terms of quality. However, the risk of color extraction of the wine can be detrimental. The only approved Clairette rose Rs clone carries the number 1003. A conservatory with 20 or so clones was set up in spring 2007 in the Bellegarde (Gard) vineyards. 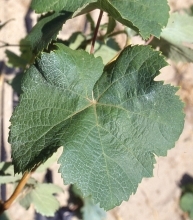 Clone conforms with vine variety characteristics.